'Jubilee Race Day' on Monday June 4 sees the intense and thrilling battle for the Castle Combe Formula Ford 1600 championship continue. Run in association with Startline, the initiative to get young drivers into racing at modest cost, the championship has seen three different winners from the first three races, with the driver leading the championship yet to top the podium. Rain has affected all the races so far this year, with no-one able to show their true form on a totally dry track, so consequently, the championship is wide open. With so many potential winners and early season form not necessarily a parameter for what is to come, picking a favourite is impossible. Fresh from winning the last race though is Bratton's Ben Norton in the Wiltshire College Spectrum. After struggling in the first two races in a car not yet happy in the rain, everything came together in race three with an amazing pass on Saltford's Steven Jensen around the outside of Tower. Jensen's defeat completed his hat trick of runner up places though, giving the Kevin Mills Racing team driver a slender single point overall lead in the standings. Jensen's team mate Roger Orgee, from Langford, is the man snapping at his heels in his Van Diemen RF00, having won the opening round and taking a pair of third places since. The third winner of the year is Coventry's Nathan Ward, another member of the ubiquitous KMR squad, also running the Spectrum chassis and looking very racy with two poles and a fastest lap in the bank. Showing plenty of promise, but not quite hitting the sweet spot just yet is Yatton Keynell's Luke Cooper, still very much in contention in the family Swift SC10. Yet another KMR Spectrum exponent is Chepstow's Nick Jones, one of a number of drivers with the potential to shine through as the year progresses. A dark horse is Timsbury's Oliver White, the 2009 Saxmax champion, who qualified on the front row in his first ever FF1600 race two years ago. After a year or so away and struggling in the first two wet races, the youngster set the second fastest race lap last time out. 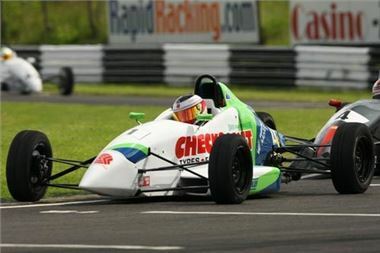 Another man with the talent to upset the order is former British F3 and A1 GP pilot Alex Khateeb from Wick. He's returning to the place where his single seater career began, aboard the sister Wiltshire College Spectrum of Norton. All of those drivers are running in class A for more modern machinery, but the B class for cars made before 1996 has plenty of its own interest. After missing the first round, Bradford on Avon's David Vivian returned with a bang for the last double header meeting, winning both races and propelling himself to 3rd in the class standings in his Swift SC92. The Higgins brothers provide opposition. Adam, from Chippenham, defends his title in his Van Diemen RF94 and brother Richard from Burnham on Sea in an RF90 leading by one point. Quietly scoring has been newcomer to the Swift Cooper team, James Raven from Portsmouth, consistency placing him equal second in the points with Vivian. Around the outside passes at Tower corner became the 'thing to do' at the last meeting, with Corsham's Will Di Claudio taking his first outright victory with just such a move in the circuit's Saloon Car championship race. Di Claudio had been tracking his former team-mate and round 2 winner Tony Hutchings and pounced as the Audi TT driver locked a wheel on the entry to the corner. The win puts the class B Peugeot 106 former title holder in the outright lead of the championship and the lack of close opposition in his class will likely see him tempted to challenge for outright wins again. Having also tasted outright victory for the first time at the last televised meeting, Hutchings will be keen to retain his class A lead, the Audi's reputed 400 horsepower no doubt assisting. Those looking to deny him include Southampton's Adam Prebble in the Rover Turbo, which missed out on valuable points last time with a mechanical failure, Bristol's Mark Wyatt in the Astra and Mark Funnell from Trowbridge in the Mini. The class C contest for under 1400cc cars has been an entertaining one between the unlikely Astra of Reading's Russell Akers and the Fiesta of Charles Hyde-Andrews-Bird from Ditcheat. A 20 lap race this time will stretch all the drivers and may bring some new names into contention. Whilst wet weather has helped his cause, Gary Prebble's overall points lead in the Vadabar Sports and GT championship is well deserved. The Southampton based Mitsubishi Evo driver has shown his usual impressive turn of speed this year, but it's been outright victory which has been his goal, a class win almost a matter of course. In perfectly dry conditions Prebble's saloon is no match for the pukka sports racing cars, but it's fun to watch the 4WD Evo leave them for dead on the line. Simon Tilling is likely to be Prebble's main rival for the title this year as well as being the man to beat on track in his B class Radical SR3. But returning to make life a little more difficult, having missed the first three rounds, is Trowbridge's Andrew Shanley in the Radical Prosport. The 7 litre Aquila of Salisbury's Nigel Mustill should thunder it's way to the front if it can lay down its power, whilst the Wayne Poole Racing team drivers, Des Andrews and Guy Parr, both from Bath, can be podium contenders in their Megahart and Nemesis respectively. Taunton's Craig Fleming has the talent to put his Juno TR250 in the mix too. Longing to be unleashed in the dry is the mighty BMW E63 M6 of Vadabar M.D. Doug Watson from Blagdon, whilst going well in Watson's old BMW Z3 M Coupe is Bath's Angus Gorringe. Many of those cars will feature in the 'fun' 'Open Sports & GTs' race. Minis of the 'Super Mighty' and 'Mighty' variety should provide some 'edge of your seat' type racing. Neil Slark from Salisbury and Bob Bennetts from Stoke Sub Hamdon are neck and neck on points in 7th and 8th in the 'Super Mightys'. Local drivers in the almost standard 'Mightys' are Radstock's Steven Rideout and Warminster's Stuart Coombs. Monday's action starts at 08:45 am with qualifying, there's a grid walkabout from 12:00 and racing gets under way from 1:00 pm.